Online Self-study - Register Anytime! I feel more ready to teach ESL students. I really appreciated the resources, videos, examples, and articles. [They] were all very helpful to me. I really enjoyed watching the videos where the theories were put into place. I got to see how the different methods worked in the classroom. I feel [the course] gave me a strong general understanding of the ideas and issues relevant in the field of teaching English to young learners. 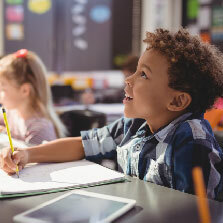 Learn appropriate methods and techniques for teaching language skills, vocabulary, and grammar to primary-aged learners, and understand the appropriate assessments you'll need to measure progress. Note: Self-study courses do not count toward the TESOL Core Certificate Program (TCCP). For questions about the TCCP, contact corecertificate@tesol.org. For more information about TESOL online courses, please contact TESOL Professional Learning.